You might think the internet consists mainly of cat videos (see our earlier post on Lolcats), but I would like to draw your attention to another online genre which has received much less attention – the video blog (vlog). 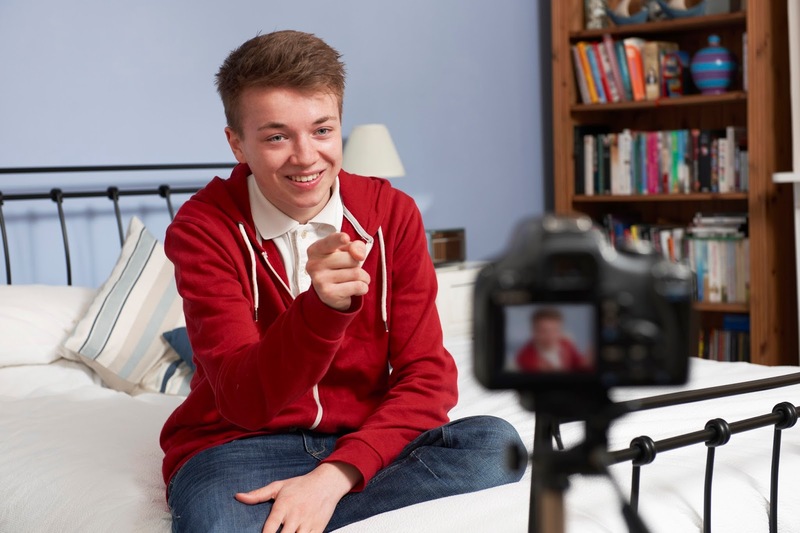 Vlogs typically feature a single speaker talking to a camera and can be found on online platforms such as YouTube. Yet, while the speaker addresses a non-present audience, he or she uses many of the features one employs in face-to-face conversation, but with a twist. How exactly do these features differ? And what strategies do vloggers use to involve their audience? In face-to-face conversation, people can indicate participant roles (for example, addressee or eavesdropper) through the content of their speech, such as using terms of address (Jack, or Jane), personal pronouns (you) and questions. In vlogs, the addressees are not present and the speaker may not even know who they are. Maximiliane Frobenius’ analysis of 30 YouTube videos posted online found that vloggers negotiate this uncertainty by using strategies such as if-clauses (e.g. if you’re interested), medium-specific terms (e.g. vlog fans, youtubers), and the default –general terms of address such as you or you guys). Such strategies motivate the audience to respond to the vlog and leave comments, which may refer back to the content of the vlog. In one example a vlogger playfully referred to users of digital media that traditionally use keyboards as keyboard cowboys. This metaphorical term motivated the audience to respond: one viewer took up and extended the metaphor to comment in writing that other users “maybe just didn’t like straddling their keyboards”. In real life, a conversation usually has a history which includes previous conversations between the participants, which may be mentioned or referenced. This is also the case with vlogs (e.g. “If you’ve seen my latest vid…”), but there are several differences. In vlogs speakers talk directly into a camera, and have absolute control over topic and wording. Also, the vlog may remain online until the vlogger removes it. 1 and it’s four hours and ten minutes in running time. 6 uh and uh the winner will be drawn in seven days from now. 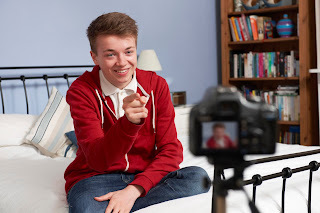 The vlogger, asking the viewers about their favourite Dr Who episode, uses a medium-specific gesture. He points at a comments section, which does not really exist in his physical surroundings. By this creative use of gesture, he demonstrates his ability to imagine the viewer’s perspective. Unlike face-to-face conversation, gaze shift in vlogs can’t be used to signal to listeners that they are being directly addressed, or to show speakers whether the listeners are following what they are saying, as vloggers usually look into a camera but have no access to their viewers’ gaze. However, gaze can play a role when others enter a vlogger’s surroundings, who may not be seen by the audience. By shifting the gaze away from the viewers and then back, especially when accompanied by comments, the vlogger can signal to the audience that they are the ones being addressed. Obviously in face-to-face interactions this sort of commentary would be unnecessary as participants would be able to easily identify the reason for the loss of attention, such as a flatmate… or a cat!